The Ephemeral Pavilion in Plaça Sant Joan in Lleida, Spain by Vora Arquitectura is an addendum to my architectural element post on inflatable enclosures. This project would fit well with the others featured. The following text and images are courtesy the architect. The balloon was designed to identify Lleida’s International Animated Film Festival – Animac. Placed in a public space, this element represents, from the outside, the festival. Its interior was the info point during daytime and guest/producer’s restaurant on evenings. 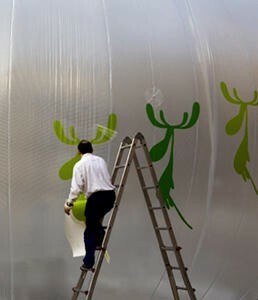 The balloon must be flexible enough to be placed in any exterior public space (street, square, ...). It should also be possible to be placed inside (room, pavilion, ...) due to its adaptable shape and size. The chosen material for the inflatable balloon is PVC together with a resistant synthetic fiber. The result consists on a semi-transparent surface where images are projected, which makes interior/exterior communication possible. A perimeter bench, made out of sandbags heavy enough to fasten the balloon to the floor sets the base. A layer of textile waste from a neighboring factory is added to make the bench comfortable. Once the festival is over, sand is for sale and textiles go back to the factory. Once empty, the balloon takes up very little space. This is important for it does not mean a storage problem for the town council while the balloon is not in use. The initial idea was to make the bubble work like a lantern for the public square. Unfortunately that was not possible due to the light intensity of the lamps in the square. As an alternative, diverse second hand floor lamps were placed along the bench perimeter. These lamps created a comfortable inviting ambience, providing individual spaces of agreeable dimension and scale inside the bubble.